Mon Oncle (French pronunciation: ​[mɔ̃ nɔ̃kl]; My Uncle) is a 1958 comedy film by French filmmaker Jacques Tati. 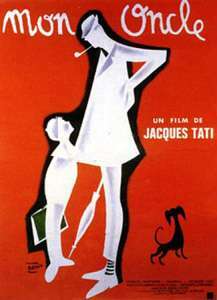 The first of Tati's films to be released in colour, Mon Oncle won the Academy Award for Best Foreign Language Film, a Special Prize at the 1958 Cannes Film Festival, and the New York Film Critics Circle Award for Best Foreign Language Film, receiving more honors than any of Tati's other cinematic works. The film centers on the socially awkward yet lovable character of Monsieur Hulot and his quixotic struggle with postwar France's infatuation with modern architecture, mechanical efficiency and consumerism. As with most Tati films, Mon Oncle is largely a visual comedy; color and lighting are employed to help tell the story. The dialogue in Mon Oncle is barely audible, and largely subordinated to the role of a sound effect. The drifting noises of heated arguments and idle banter complement other sounds and the physical movements of the characters, intensifying comedic effect. The complex soundtrack also uses music to characterize environments, including a lively musical theme that represents Hulot's world of comical inefficiency and freedom. At its debut in 1958 in France, Mon Oncle was denounced by some critics for what they viewed as a reactionary or even poujadiste view of an emerging French consumer society, which had lately embraced a new wave of industrial modernization and a more rigid social structure. However, this criticism soon gave way in the face of the film's huge popularity in France and abroad – even in the U.S., where rampant discretionary consumption and a recession had caused those on both the right and the left to question the economic and social values of the era. The film was another big success for Tati with a total of 4,576,928 admissions in France. M. Hulot (Jacques Tati) is the dreamy, impractical, and adored uncle of nine-year-old Gérard Arpel, who lives with his materialistic parents, M. and Mme. Arpel, in an ultra-modern geometric house and garden, Villa Arpel, in a new suburb of Paris, situated just beyond the crumbling stone buildings of the old neighborhoods of the city. Gérard's parents are entrenched in a machine-like existence of work, fixed gender roles, the acquisition of status through possessions, and conspicuous displays to impress guests, such as the fish-shaped fountain at the center of the garden that, in a running gag, Mme. Arpel activates only for important visitors. Each element of Villa Arpel is stylistically- rather than functionally-designed, creating an environment completely indifferent to the comfort, or lack of comfort, of its occupants. In choosing modern architecture to punctuate his satire, Tati once stated, "Les lignes géométriques ne rendent pas les gens aimables" ("geometrical lines do not produce likeable people"). From inconveniently-located stepping stones, to difficult-to-sit-on furniture, to a kitchen filled with deafeningly loud appliances, every facet of Villa Arpel emphasizes the impracticality of a dedication to superficial aesthetics and electrical gadgets over the necessities of daily living. Despite the superficial beauty of its modern design, the Arpels' home is entirely impersonal, as are the Arpels themselves. In fact, M. and Mme. Arpel have completely subordinated their individuality to maintain their social position and their shiny new possessions. Tati emphasizes his themes surrounding the Arpel lifestyle (as well as M. Arpel's automatonic workplace, Plastac) with monochromatic shades and cloudy days. By contrast, Monsieur Hulot lives in an old and run-down city district. He is unemployed, and gets around town either on foot or on a VéloSoleX motorized bicycle. Gérard, utterly bored by the sterility and monotony of his life with his parents, fastens himself to his uncle at every opportunity. Hulot, little more than a child himself at times, is completely at home with Gérard, but also completely ineffectual at controlling his horseplay with his school friends, who take delight in tormenting adults with practical jokes. Exasperated at their relative's perceived immaturity, the Arpels soon scheme to saddle him with the twin yokes of family and business responsibilities. 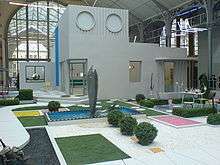 The sets for the film, designed by Jacques Lagrange, were built in 1956 at Studios de La Victorine (now known as Studios Riviera), near Nice, and torn down after filming was complete. An English version of the film, nine minutes shorter than the original and released as My Uncle, was filmed at the same time as the French-language version. There are slight differences in the staging of the scenes and in the performances. In the English-language release, French signs are replaced by ones in English; important dialogue is dubbed in English, although background voices remain in French. Bosley Crowther said the film had a "cast of colorful and adroit supporting players, all nonprofessionals" and a "gay but somewhat monotonous musical score"; he called the film "perceptibly contrived when it lingers too long and gets too deeply into the dullness of things mechanical. After you've pushed one button and one modernistic face, you've pushed them all. Mr. Hulot [as played by Tati] is the focus of amusement, not electrical doors and machines that squeeze out plastic hose." Crowther noted that its style of humor "was done superbly more than twenty-five years ago by René Clair in À Nous la Liberté and afterward by Charlie Chaplin in Modern Times." Variety said that although it was "somewhat long for a comedy, Jacques Tati's film has inventiveness, gags, warmth and a 'poetic' approach to satire"; they complimented the film's "expert blocking out of the characters, creative use of sound, and eschewing of all useless dialog." 1 2 3 4 Crowther, Bosley (November 4, 1958). "Screen: Tati's Look at Modern Life". The New York Times. Retrieved 2009-05-24. 1 2 3 4 5 "Mon Oncle: My Uncle (France - Italy)". Variety. 1958. Retrieved 2009-05-24. ↑ Rosenbaum, Jonathan, The Color of Paradise, Chicago Reader Movie Review Article: Jour de Fête, Tati's first full-length film, was filmed in colour but released in black and white due to technical issues. ↑ "The 31st Academy Awards (1959) Nominees and Winners". oscars.org. Retrieved 2011-10-27. ↑ "Festival de Cannes: Mon Oncle". festival-cannes.com. Retrieved 2009-02-10. ↑ "Les Années Sauvages: Mon Oncle". Arte Magazine. No. 20.45, Cinéma. 30 December 2002. p. 2. ↑ "Visitez la villa arpel au 104" (in French). SortirAParis.com. 2009-04-02. Archived from the original on 2009-05-13. Retrieved 2009-05-24. Le décor du film Mon Oncle fut monté en 1956 aux Studios de La Victorine, près de Nice, et détruit à la fin du tournage.